You may be asking: How can I use the tomatoes, corn, zucchini, and other summer vegetables available at the farmer’s market or in my backyard plot? Here’s one solution: Make a vegetarian stew. “Although stews are typically winter fare, this old-fashioned combination of fresh vegetables is a light and healthy entrée or side dish,” says corporate chef and cooking instructor Karin Calloway, who developed the recipe featured here for Viking Range. 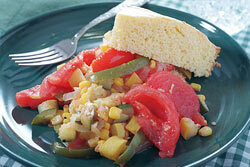 This easy-to-make stew combines tomatoes, corn, yellow squash, and zucchini. It takes just minutes to prepare. The vegetables are sautéed in extra virgin olive oil along with onions. The veggies get a dash of salt and freshly ground pepper. You can turn up the heat with some cayenne pepper. Enjoy the dish … and think about ways to cook with the new crop of Autumn vegetables, like winter squash, Brussels sprouts, broccoli, and mushrooms.